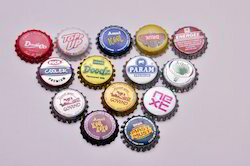 A compressive range of Printed Crown Caps are manufactured and exported, which is widely demanded in ALCOHAL & BEVERAGE, DAIRY & FOOD processing industry. They come in 2 variants, Puff & Dry Blend. The packed product with these crowns can withstand very high pressure, can be sterilized & can be vacuum packed. These crowns are made from high quality Tin Sheets, both Tin Plate & Tin Free Steel, that is being procured from reliable vendors worldwide. Available in the std. size of 28 mm and are well packed in order to provide safe delivery to our valuable clients. Looking for Crown Cap ?